For an Extension professional to help the groups they work with be successful, they often have to help them deal with challenges along the way. Just as people are a group’s greatest asset, often a group’s greatest challenges are people related. This article explores some suggestions that can help deal with challenging situations, when dealing with groups. The information in this post is general in nature. If a challenge is particularly difficult, a lot is at stake, or a situation may be becoming in anyway dangerous. Expert professional advice needs to be sought. When helping a group deal with challenges, assertive communication is often required. As well as listening effectively (click here for more information), you will need to be able to express your own feelings and ideas in a non-threatening way, for successful two-way communication within groups. When things are difficult in groups, all group members need to be encouraged to communicate well and not in ways that will promote conflict. Being able to express ourselves clearly, without becoming aggressive, is called assertive behaviour. Assertive communication is often required, in order to get a group to acknowledge there is a problem and to then facilitate them in addressing it. One important aspect of assertiveness, is the relationship between self assertion and self esteem. 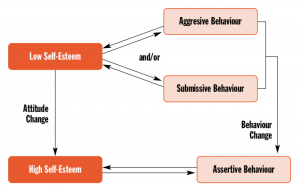 Low self esteem can lead to aggressive or submissive (passive) behaviours, whilst high self esteem, means people are often more comfortable with themselves and are able to have effective assertive behaviour. A facilitator can help people feel more comfortable by demonstrating and encouraging assertive behaviours and helping build self esteem in individual group members. They can also reflect on their own self-esteem when working with a group and the influence this may be having on how they deal with the challenges that may arise in their role. Aggressive Behaviour – when we are aggressive, we stand up for our personal rights and express our thoughts and feelings, but we do this in ways which are usually not helpful and almost always step on the personal rights of others. Examples of this behaviour are blaming, threatening and fighting with others. We usually act angrily, frustrated or self- righteous. We often feel bitter, guilty or lonely afterwards. This behaviour is often about trying to dominate, protect, win, humiliate and force other people to lose. Aggressive behaviour in groups has to be dealt with quickly and effectively. It is first important to acknowledge that if this occurs in a group, it can be very challenging and confronting for a facilitator, as well as for the group as a whole. Helping people deal with aggressive behaviour or anger, can begin with assisting group members ‘own’ the feeling. For example, people stating assertively “I am angry right now”, is an appropriate response, rather than “you make me angry”, which is a blaming statement and will only fuel aggression on “both sides”. As a facilitator, pointing out and encouraging good use of language can help diffuse things. For example, acknowledging people’s feelings, “I can see that you are very angry” helps. If you ignore or don’t encourage acknowledgement of their feelings and their cause, they are likely to intensify and conflict is likely to be the end result. All group members need to realise that aggression in groups can be very disruptive and damaging to group processes, relationships and harmony, they all need to realise that effectively dealing with aggressive behaviour, if it occurs, is very important to group and also individual success. When people with opposing points of view are encouraged to calm down and talk rationally, then at that point you may ask the instigator what issue has upset them in particular. At that point, you could also ask what the other person or people need, want or expect going forward. This will give some action steps, whilst being careful not to reignite things. If relationships are breaking down, they need to be renegotiated in terms of how the group is to function, regardless of the issues at hand that may have triggered things. At this point it may be important to separate out the relationships from the issues and make relationship preservation the primary outcome. If misunderstandings have occurred, they need to be acknowledged and dealt with. Compromise and effective negotiation skills are important in this situation, click here for further information. Depending upon the situation and how important the issue and relationship preservation is, it may come to a point where a facilitator needs to organise for some professional mediation in order to “save” the situation. If things have gone too far and an effective resolution is not coming easily, it is good to acknowledge regret. If appropriate, get parties to apologise and tell each other person what they have learned from the experience. It may be at the point where, a person or people are no longer able to be effective group members and it is better if they are to leave. Accept another’s feelings as being real and valid and not to argue with the way the person feels. Never take criticism personally. Let the complainer feel it’s all right to be upset. If you oppose their feelings, they will continue. But if you accept their feelings, they will diminish. Look for the feelings that they can agree with and tell the other person you understand. Submissive (Passive) Behaviour – when you exhibit passive behaviour, you give up your rights by not expressing your honest feelings, thoughts and beliefs. It often involves permitting others to ‘walk all over’ you. It can also mean expressing yourself in such an apologetic way, that you are overlooked. We behave passively when we do what we are told, regardless of how we feel about it. When we act passively, we often feel helpless, anxious, resentful and disappointed with ourselves. The goal of passivity is usually to please others and to avoid conflict or rejection. A facilitator needs to recognise such behaviours and use tactics to encourage and enable equal contribution. Assertiveness is a communication technique designed to demonstrate respect towards oneself and others and to allow the expression of a full range of behaviours. Assertiveness is self-expression through which one stands up for one’s own basic human rights, without violating the basic human rights of others. It is an open, honest, direct and appropriate expression of what a person thinks, feels and needs. Assertiveness is one aspect of communication. Being assertive and self-directed in a situation, means knowing what you want, and communicating it directly and clearly without putting others down. Self-awareness – Knowledge of your own goals and behaviour and the reasons for valuing them. Self-acceptance – Positive self regard in the face of your natural human weaknesses and mistakes. Honesty – Congruent and truthful verbal and non-verbal expression of thoughts, feelings and intentions. Empathy – Understanding and acceptance of other’s experiences and feelings as valid from their points of view. Responsibility – Assuming ownership of your feelings, desires, needs and expectations. Mutuality – Accepting another person as equal and demonstrating a willingness to negotiate issues from a win-win stance. This list provides specific ways to inspire motivation and enhance self-esteem. At first glance, some of the suggestions may seem trite. However, if they are used consistently, they will have a positive impact on motivation. Praise the specific task or job. Give special assignments or projects. Write down other people’s ideas. Recognise important events in other’s lives. Point out the good consequences of another’s actions. Ask for opinions on how to solve problems. Show constructive concern about performance problems. Smile, ask about other’s interests. Inquire with empathy about someone’s family or other non group problems. Provide a new piece of equipment. Ask a person to lead the whole meeting or part of it. Establish and keep follow-up dates. Accept the criticism – when a criticism is realistic, your most powerful, assertive response may be a simple acceptance of the criticism. An acceptance response is not apologetic, does not defend and should not put yourself down. Disagree with the criticism – often criticism does not fit, or the criticism is based on false information. If this is the case, it is important to NOT to accept the criticism, but to simply disagree. Sometimes, however, we have difficulty in disagreeing with criticism, because many people equate disagreeing with attacking another person or being argumentative. Set limits – setting limits involves teaching another person how we expect to be treated. You spend too much time on your work. I can’t accept that. I feel that I’m doing something important to me. I disagree. I’m just trying to take care of myself. No. I feel I devote my full attention only to issues that need that amount of concern. I find I am very organised with important activities. By setting limits we let another person know “This is where I draw the line”. Setting limits involves saying “no” to the external demands of other people, when those demands go against our internal needs. Common areas of limit setting concern time, privacy, energy and money. Another important feature of limit setting, is that I teach other people how to treat me. Fogging – Fogging is a response to criticism that does not say “yes” or “no”’. If I am fogging, I briefly acknowledge that a person has criticised me and then quickly move to another subject. Fogging is useful when a criticism, does not evoke a strong emotional reaction and is not important. Giving yourself permission not to respond immediately to criticism, does not contradict the goal of being spontaneous. Being able to recognise difficult behaviours and managing them effectively is one of the best ways to reduce conflict in a group. The person who is exhibiting the difficult behaviour, may actually be trying to be helpful from their perspective and get across what they consider to be useful input. It may only be difficult for you as the facilitator, or only some of the group and not the rest of the group. Remember that we are all difficult people to someone at some point in time, so we should monitor our own behaviour, with a view to making changes if necessary. Acknowledge that while some people are deliberately difficult, others have no deliberate intent. So, keep cool and professional and remember that they too may welcome a chance to change. Work at all times towards creating a win-win situation, in which there are gains for both sides if possible. Conflict can often be made to pay dividends in the long-term. Remember that we all have choices. We can evade, avoid, turn aggressive and suffer the energy drains and frustrations inherent in ‘difficult people’ problems, or we can act constructively to create productive win-win outcomes. Never take the easy option of saying “If you can’t beat them, better join them”. You’re likely to lose out in the end. Analyse your vulnerability. Try to understand why difficulties are arising. Be honest with yourself. Plan your own coping strategies and strategies to use with the group as a whole. Be positive. Don’t continue on a path of frustration and anger; that’s the unproductive way. Remember, if you can’t be there for yourself, you can’t be there for others. These are generalisations about challenging group members, who may fit with one or more of them. 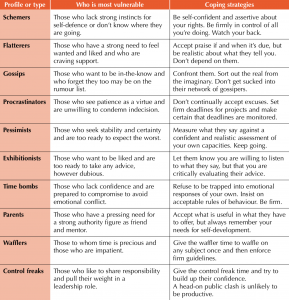 If you are having trouble with some group members, the list below can help you identify what sort of people you may be dealing with and some thoughts on coping strategies. The list of profiles can be depressing to go over, but thankfully in most groups, these profiles do not appear that often or in multiple numbers at once. Schemers or Underminers – these people are the plotters, who may not be upfront about things, but are ready to put a knife in the back or a spanner in the works. For whatever motive, whether for malice or just for fun, they are out to sabotage you, the group or particular group members. Flatterers – these people will pat people on the back, make them feel wonderful, praise them to the skies. But somehow, when support is really needed, all the good feeling tends to evaporate and they are not there for people. Gossips – these people know all the scandal and they have advance news of everything that’s going to happen. Usually though, all their news is bad news and their rumours can be malicious. Procrastinators – these people spend more time in avoiding work and inventing reasons why they are not getting a job completed. They always seem overloaded, or just busy somewhere else. Pessimists – these people are the spreaders of doom and gloom, ever ready with reasons why the schemes or ideas can never work. They can see a flaw in every plan, a dark cloud in every silver lining. Exhibitionists – these people love to boast about their know-how and wisdom, which somehow always seems to be superior to your’s or others in the group. They talk loudly about what they will do, but does it actually ever get done? Time bombs – these people are the emotional ones, ticking like a time bomb on a short fuse, liable to erupt at any time. Every issue is a dramatic one. They deal in pressure and emotional blackmail. Parents – these people are the father and mother figures, just like over-critical parents from childhood. They can make us feel guilty as easily as they can make us feel inadequate. All for our own good. Wafflers – you know the sort of person who prattles and waffles and talks around in circles and paints word pictures and explores every possible blind alley, until you think they are never going to get to the point. You and fellow group members then try not to ask anymore questions in the hope that they will stop and not waste anymore time. Control freaks – these people can be very difficult to handle. They like to attend delegations and negotiate on their own. Control freaks limit the flow of information to individuals so that they, and only they, have all the information. The table below shows who is most vulnerable (prone) to the behaviours of particular profiles and some coping strategies to deal with them. When we differ with someone about the ideas and goals that we want to pursue, don’t agree on priorities or issues and outcomes, or how to allocate resources such as time, labour and money; there is the potential for conflict. Handled well, this potential conflict can actually have positive results. Handled poorly, the outcomes can be a disaster. Discomfort – perhaps nothing is said yet. Things don’t feel right. It may be difficult to identify what the problem is. You may feel uncomfortable about the situation, but are not quite sure why. Incident – here, a short, sharp exchange occurs without any lasting internal reaction. Something has occurred between you and someone else, or between group members, that has left people upset, irritated or with a result that wasn’t wanted. Misunderstandings – here, motives and facts are often confused or misperceived. People’s thoughts keep returning frequently to the problem. Tension – here, relationships are weighed down by negative attitudes and fixed opinions. The way you feel about and regard the other person, significantly changes for the worse. The relationship is a source of constant worry and concern. Crisis – behaviour is affected. Normal functioning becomes difficult. Extreme gestures or actions are contemplated or executed. You may be dealing with a major event like a possible rupture in a relationship, leaving a job, threats of violence. When responding to resistance from others, it is sometimes possible to buy some time and not have things escalate to conflict. When faced with a statement that has potential to create conflict, ask open questions to reframe the resistance you are getting. Explore the difficulties and then re-direct the discussion to focus on positive possibilities. Sometimes, how we present or look at things can have a very different outcome. The following shows some principles that you can use. On the left side are the options we could use less often and on the right side are the alternatives that we could try to adopt more often. Think – think of one particularly difficult person you know with whom you tend to have problems, (Don’t worry. We all have a few.) Ask yourself what exactly are the problems? What’s going wrong? Is there a pattern? Feel – choose one recent situation in which you found it difficult to cope with this particular person. Describe the situation to yourself. What affected you? Was it a look, a tone of voice, body language, the words used? Be fair and objective. Question – now ask yourself: How often does this happen with this particular person? Is it happening only to me or are other people having problems too? Turning the situation around, how do I think this person is viewing me? What might I be doing to affect or perhaps provoke or encourage them in their behaviour? 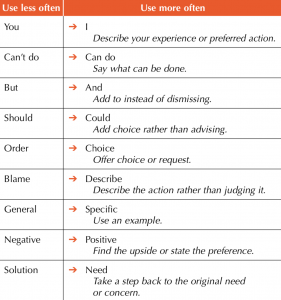 Choose – work on an action plan. Ask yourself: What can I realistically do to change the situation? What options are open? Do I choose a win- win option or just work on getting my own back? Am I prepared to carry through the option I select, and perhaps pay the price of failure if necessary? Do I have a potential outcome that makes a win-win really attractive to me? Plan – begin your action plan by identifying the profiles of this particular person. Jot down some notes on paper. Turn now to considering ways of dealing effectively with the problem. What are the coping strategies for handling the profile or profiles this particular person shows? Again, be clear and specific. What is the outcome you want to achieve, what is the win-win, this can then become the focus, rather than your reaction to their problem behaviours. Rehearse – having decided what strategies you will use, rehearse what you will say and the steps you are going to take. Practise before a mirror maybe. Or role play with a friend or make a recording. Try to anticipate what may go wrong. Now, follow through and re-evaluate! 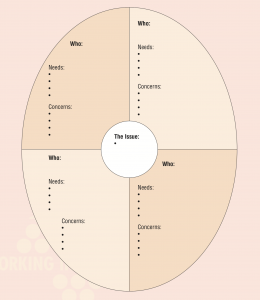 In the centre circle, briefly define the issue, the problem area or conflict in neutral terms, that all would agree on and that doesn’t invite a yes or no answer. For example “succession for the farming business” or “the future of the farm”. Don’t write it as “should Mary get the farm” because it is a closed question that invites a yes or a no response. In the sectors of the large circle, write the name of each important person or group. Write down each person’s or group’s needs. What motivates each person? Also write down each person’s or group’s concerns, fears or anxieties. Hear in your own mind, the language or phrases that the person would say to us and write them down. 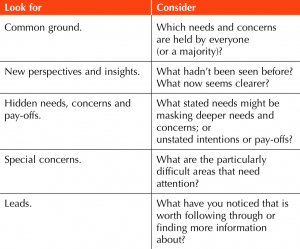 Be prepared to change the statement of the issue, as your understanding of it evolves through discussion and be prepared to draw up other maps of related issues that arise. Highlight the major needs of each participant. Now develop options which incorporate as many of these needs as possible. Then talk to each of the key players to test your understanding of the situation. Alter the map as needed. Repeat the cycle as many times as you need to. Remember, conflicts are often not solved in a day! Concentrate on the approach and then the outcomes, see an approach through, before judging whether it is successful. Win-win situations are not always possible. Maintain an attitude of respect for all parties. Be willing to fix the problem. Focus on the issue or outcome. Be hard on the issue, easy on the person. What are the long-term and short-term consequences of a win-lose outcome? What are the advantages of win-win? Identify a number of options and develop the ones that give everyone more of what they need. If needs be, redefine what constitutes a ‘win’. E.g. an effective relationship may be more important than a particular outcome. What can be done to balance a loss? Make it easy to say ‘yes’. Offer options that are of high value to them and easy for you to give. Listen to and acknowledge their needs and concerns. Support what is legitimate and fair. Avoid infringing your own and others’ rights. Maintain dialogue or its possibility. (2001) Meat and Livestock Australia, Edge Network, Working in Groups Workshop Notes. (2003) Kilpatrick, S. Bond, L. Bell, R. Knee, J. Pinkard, G. Effective farmer groups for defining best practices for sustainable agriculture. The Regional Institute Online Publishing. Dairy Farmer Discussion Group Resources Kit. Dairy Australia. (1996) Landsberg, M. The Tao of Coaching. (1996). Harper Collins Business. (1990) Bolton, R. People Skills, (1990). Simon & Schuster: Brookvale, Australia. (1992) Covey, S. Principle-Centered Leadership. Simon and Schuster: New York. (1996) Blanchard, K. & Johnson, S. The One Minute Manager. Harper Collins Business: United Kingdom. (1985) Smith, N. Ainsworth, W. Murray. Ideas Unlimited (1985). Thomas Nelson: Melbourne, Australia. (1983) Von Oech, R. A Whack on the Side of the Head. Warner Books: US. (1998) Johnson, S. Who Moved My Cheese? Vermilion: United Kingdom. (1989) Cornelius, H. & Faire, S. Everyone Can Win. Simon Schuster: Australia.